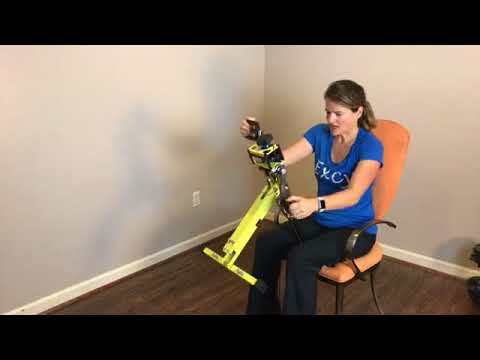 Using Excy in the Upper Body Ergometer (UBE) position as a hand cycle from a chair is one of our favorite ways to use Excy. You can do this arm pedal position from a chair, park bench, the couch, a wheelchair, and pretty much wherever you can find a chair that you can sit in comfortably. Today, which is day 4 of the Excy Upper Body 7-day challenge, we place Excy right in front of us from a seated position where you can pull Excy close into you for a comfortable workout. You will want your palms facing each other on the cranks and can rest up against the back of a chair, or if you want to engage your core more, opt for not using the back of a chair. Either way, it’s important to focus on posture and sit up nice and straight. This can be a great position to work on range of motion or to burn some calories and also incorporate strength training. When using Excy as an upper body ergometer, most people should hand cycle with the easiest resistance levels first and then, as you get stronger, explore making the resistance levels more challenging. For the bet results, focus on understanding the basic level of the hand cycle exercise before advancing. As you advance, you can explore more athletic moves like lifting up your legs to more fully engage your core. There are so many different ways to use Excy, whether as a recumbent exercise bike, desk cycle, unicycle, an upper body ergometer (UBE) to hand cycle anywhere and so much more. This is a great starter position to get started!